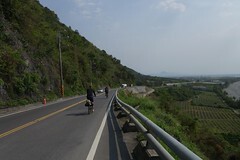 Did 120 kms today to Guguan and back. Lovely skies and a strong tailwind made the ride a joy. Taiwan can still make a comeback. Labor Minister quits after defeat on minimum wage. 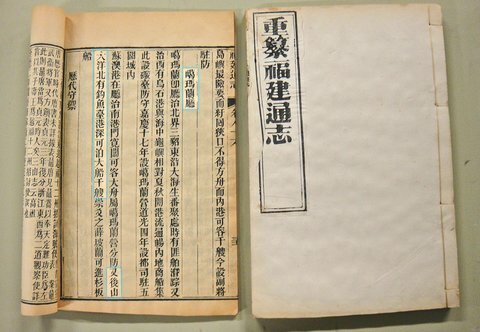 Ben with great post on Ma and the Senkakus, don't miss the information at the bottom. Round up: One Third of Taiwan firms in China Kaput? Taipei rush hour traffic insanity. Taiwan's intelligence chief yesterday warned that one in every three Taiwanese companies based in China are facing closure this year due to rapidly decreasing profits, a media reports said. Another 30 percent of Taiwanese firms are also “struggling” in China, Tsai Der-sheng, head of the National Security Bureau, told a parliamentary session without giving details, the United Evening News reported. “There is both risk and opportunity to invest in China. However, we can not deny the benefits of economic exchanges between Taiwan and China despite the growing risks,” he was quoted by Taiwanese news radio BCC as saying. 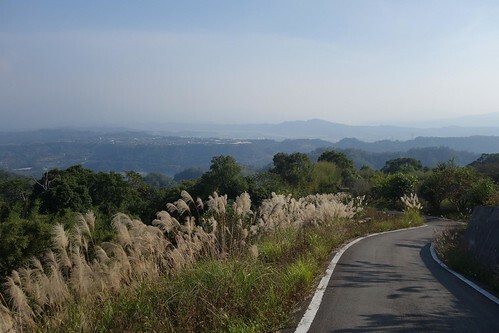 J Michael in the Diplomat: would Taiwanese fight? Hahaha. Total nonsense story about Taiwan makes its way around Christian web world. A graphic from Apple Daily, Sept 24, reminds us why the Ma Administration is thrusting Taiwan into the Senkakus mess: because the gov't needs a good distraction. Inflation ticks along at a steady pace, normal but painful in a nation with stagnating salaries. The list shows the price changes in goods since 1998, including rent -- a 30 ping apt has risen from $15K to $22K a month, not one of the bigger rises. Ordinary people are being forced out to the Taipei burbs.... or farther. Masking the effects of price rises is the Taiwanese habit of living at home until marriage, meaning that many people are being subsidized by the wealth their parents accumulated a couple of decades ago in the waning days of the go-go era. Not all of this is under government control, and it is notable that water and electricity remain cheap -- water is the same price it was 13 years ago. 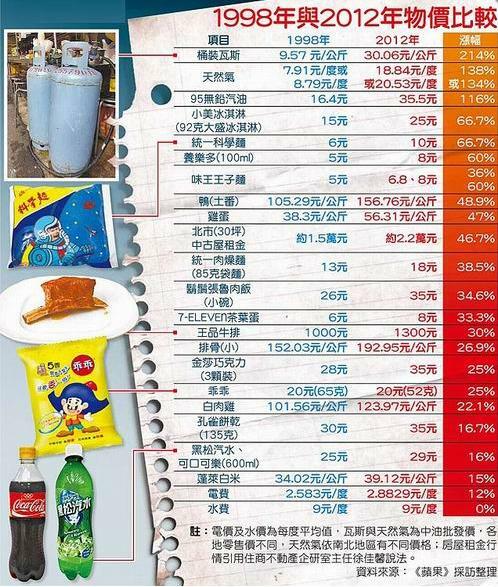 Where the government can intervene to keep prices low, it has -- yet low water and electricity costs keep Taiwan investing in heavily subsidized water and electricity hungry industry, instead of clean industries of the future. Organized religion is about control. Thanks, J Michael. Jenna's mountain rescue in Yilan. Harrowing tale. Explore love hotels in the place where romance blossoms.... you know, Yunlin. Not many people get what's going on in Asia. But Philip Bowring does. Paul Lin, always a good read, with discussion of politics behind the islands dispute. Industrial output rises in August. Yes, that's right, RISES. The government continues to flog Sun Moon Lake as if there were no other tourist destinations in Taiwan. Times of India this time. Speaking of India, former DPP pres candidate Tsai Ing-wen is there. w00t! I've been hoping Taiwan and India could get together since the 1990s when I was writing letters to the editor about it. Good to see this kind of thing happening. Weird right-wingers march in Taipei over Senkakus mess. Taiwan and Japan increasing intelligence exchanges, media reports, defense folks deny. I've looked at student protests on this blog several times. The current generation of students is politically involved but in a way that is orthogonal to the Blue-Green divide: they tend to gather to protest in situations involving social justice issues that are not exclusively of one camp or the other. For instance, the value of property is currently estimated by real estate appraisers hired by the construction firm that initiates the renewal project; a property owner opposed to an urban renewal -project is given just one opportunity to object; and as long as two thirds of land or property owners in a certain area agree to the project, the properties of those who are opposed to it can be seized by force, regardless of their owners’ wishes. This is basically a giveaway to big land developers, who can bring in the police to enforce their theft of smallholders' property, and can themselves determine the value of the land. Scary. ... below is a report I wrote up in April 2012 for the forced eviction case that took place in Shilin earlier this year after meeting with one of the lawyers. Unfortunately, the case is still ongoing as is the typical fare of controversial issues in Taiwan society. I hope this gives English readers an update on the background of what is going on and now I am far more interested in gathering the right forces and strategize for English writers to put together something cohesive for the international sphere to then push back on the local media and apply pressure on the local government to step in and take action. (click on READ MORE below to continue). If we had elected Tsai, would the government be sending boats to the Senkakus? Would the government be annoying Japan with Ma's stupid claims that the ROC owns the Senkakus and pointless military demonstrations? Would we be making the US nervous that Taiwan might work in concert with China? What would be the focus of the government's moves, getting the economy going, or this senseless shouting at Tokyo about the Senkakus? Collection of photos from late 1950s US serviceman. Picasa link. T'anks, USTDC! Taiwan discovers sale of illegal male enhancement drugs. Let the snark begin! Control Yuan head blasts Ma's legacy: incompetent. US says China practiced Taiwan attack. No kidding? Really? Pomelo peels drying. They will be mashed and mixed with sugar to make a base for pomelo tea. Han Yi-shaw in the NYTimes has produced a total propaganda column on the Senkaku mess, with highly selective use of sources and what appears to be a deliberate mistranslation. I'll take a look at it tomorrow, no time tonight. 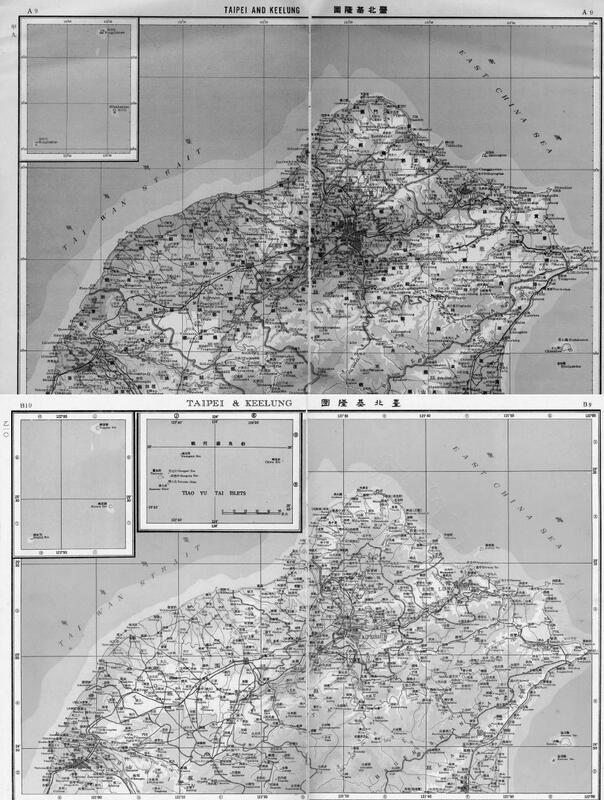 But once again, I urge the reader to consult this awesome post in Chinese with maps and texts as well as Ampontan's post Coming Attractions. Han's piece is well beyond sad, sadder still that someone as well known as Kristoff gave it his imprimatur, in the nation's major paper of record too. The US has reiterated its position that the Senkakus are under its security umbrella. Hopefully the US is speaking to Beijing and Tokyo on this. Taiwan sends a ship just to peeve the Japanese too. Wife + dog = afternoon stroll. Cindy Sui with excellent piece on Chinese students in Taiwan and how they are learning about democracy. Before you get all excited about the prospects, just make a mental list of all the elites the world over, including many here in A Certain Political Party, who were educated in democracies and then went on to participate enthusiastically in authoritarian politics. Yeah, a lot. Top China Affairs officials shuffled. Saddening...I've had so many great interactions with Filipino workers here. 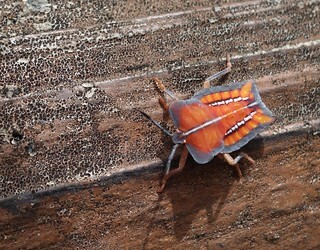 Under the Radar links from AsiaEye. Laowiseass with some observations on behavior in Taiwan and in China. Do the Taiwanese congratulate themselves too much that they aren't like China anymore? Ma appoints longtime hatchetman and political strategist King Pu-tsung as envoy to the US. Say what? That's rather like Bush appointing Karl Rove as Ambassador to Russia. Former Chinese Nationalist Party (KMT) secretary-general King Pu-tsung (金溥聰) will take over the position from Jason Yuan (袁健生), who will assume the post of secretary-general of the National Security Council, following the resignation of council head Hu Wei-chen (胡為真). King, 57, has been one of Ma’s closest aides since joining his campaign team and helping him win the Taipei mayoral election in 1997. He promised not to take up any position in the Ma administration after helping Ma win the presidential election in 2008 and has only taken up different positions within the party. However, speculation that he will ultimately be trusted with a major position in the Ma administration has never subsided. The Presidential Office and the KMT yesterday dismissed concern about King’s lack of experience in foreign affairs. Sources in the KMT said that as a top aide of Ma, King would be able to convey Ma’s policies more accurately and promote relations with the US more efficiently. The director of the party's Chiayi City department resigned as a protest against King's appointment, reports said yesterday. The official later told reporters he was leaving his post because he had completed his mission, the re-election of the city's KMT mayor in the election. Party officials said they would try to persuade him to stay on. Media reported similar resignations of leading KMT officials in neighboring Chiayi County and in Yunlin County, allegedly as a reaction to King's appointment. DPP lawmaker Lee Chun-yee said King was the wrong choice to head the party structure, because he would find it difficult to communicate with grassroots workers in Southern Taiwan. Outspoken KMT lawmaker Chiu Yi described the new secretary-general as a "knife that is sharp, but not precise." Li Keng Kuei-fang, a KMT member of the Taipei City Council, said King needed to work on his interpersonal relations. Putting King in such a senior position in the party might bear risks, because if he failed, the failure would be associated with Ma, said KMT legislator Lee Ching-hua. King was a "visiting scholar" at Brookings three years ago when he was plucked from there an elevated to KMT secretary general so is probably known to at least some in the US policy community. But Ma's appointment of a longtime insider and enforcer to a diplomatic post with Taiwan's most sensitive and important ally raises some pretty interesting questions. Does Ma feel that the ROC diplomatic corps, whose topmost people are almost all Deep Blue, is too independent of him? Does Ma feel that he needs more control over US relations? Does Ma want to put a political expert and intriguer at a distance? Is he rewarding a loyal subordinate with a plum post? Are the coming years about the "peace accord" with China that Ma has promised and that the cabinet reshuffle was about yesterday? During the phase of smooth walk into "peace," will the US need to be "stalled" "charmed" and "satisfied" somehow by a political Tai-Chi veteran such as King? Is it "all of above" as in the Chinese saying "a smart rabbit maintains three nests (i.e. just in case)"? There is nothing to say because there is so much to say ....events spinning out of control? Or will two powerful nations spike this rush to stupidity? Read this. China with hundreds of fishing boats heading for Senkakus. Seaborne militia vessels already encroaching on Japanese waters. Japanese right-wingers land on Senkakus. Japan will not "sit idly by" -- strong language, a warning out of history. Of course, tomorrow our government agencies here on The Beautiful Isle will announce they are monitoring it and on top of it, as my man Ben just pointed out to me. Spectators. Ma's policy of using the Senkakus to irritate relations between Japan and Taiwan and the US and Taiwan is now exposed, as is Taiwan's military and diplomatic weakness... What will Taipei dither do next? J Michael argues that the point where the Senkakus mess becomes unmanageable has not yet been reached. Oz discusses the 2-28 memorial in Puli. One Country, Two Systems Under Threat? Every Taiwanese can look at Hong Kong and see Taiwan's fate. Protests in China from Peking Duck, Japanese firms suspending operations there. James Holmes offers many of my old objections to Taiwan buying submarines. Taiwan shifting from hardware making to internet economy? Premier pledges to focus on improving economy. What were they doing before? The tiny island of St. Lucia has announced it will maintain diplomatic relations with Taiwan, surprising many who expected the new government to favor China. Prime Minister Kenny Anthony said in an address late Tuesday that he wants to explore new opportunities for bilateral cooperation with Taiwan, but that he also wants to maintain fraternal relations with China. 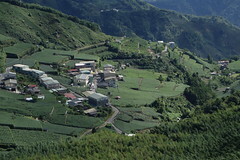 St. Lucia held relations with Taiwan from 1984 to 1997, with China from 1997 to 2006 and again with Taiwan since 2006. Anthony also revealed that his government had initiated investigation into alleged payments made to members of the former government by Taiwan in 2007. “We expressed the view that in our judgment, such payments and procedures, if made, breached both the law and acknowledged parliamentary practices in the authorization of the use of the funds,” Anthony said. The St Lucian leader hinted the probe will also cover what has become known as ‘Black Bay Scandal’, in which around 500 acres of land on the island’s southern tip was made available to a hotel developer in an investment that later failed, prompting the current government to buy back the land at a cost of 58 million EC dollars (21.4 million US dollars). Since returning to office there has been much talk of building cross-party relationships but the traditional divisions between government and opposition are already resurfacing, particularly over St Lucia’s controversial relationship with Taiwan. While in opposition, Dr. Anthony frequently complained about the method used by Taiwanese Ambassador Tom Chou to disburse funds to the UWP government and called for the money to go into the central government’s purse, the consolidated fund, instead of being funnelled directly into various municipalities to fund community projects. The Taiwanese diplomat argued that once the funds were sent directly to the government in Castries, there was no guarantee that it would be used for their intended purpose. But the SLP had often accused UWP ministers of having direct access to “Taiwanese largesse” and using it for their own purposes, including funding their re-election campaign. The clandestine manner in which diplomatic ties were established between Taiwan and Saint Lucia will be etched in all our minds for a long time. It remains one of the more sordid episodes in our political history. It has left many lingering questions for the state and for our citizens. For instance, it is an intriguing question as to why the late Sir John Compton, who was the architect of diplomatic relations with Taiwan during the period of the Cold War, was in fact willing to maintain diplomatic relations with mainland China; relations which were established by the Labour Administration in 1997. Furthermore, we are still unsure of what truly transpired in those fateful days and weeks of April 2007. Up to this day, this Government still cannot find any record of a formal agreement establishing bi-lateral relations with Taiwan, even though former Prime Minister Stephenson King makes mention of it in correspondence relating to the disbursement of Taiwanese funds. The speech is not only a condemnation of Taiwn's foreign policy conduct during the Chen Administration, but a good explication of the issues small countries face in the Beijing vs Taipei tug-of-war. He observes.... "It would be both historic and helpful – indeed it would be perfect – if Saint Lucia could find a way to benefit from ties with both China and Taiwan, however defined. This is a dream many countries share and there has been no better time than now to engage China and Taiwan on this issue - as it relates to Saint Lucia - in the context of their increasing “cross straits” mutual cooperation and understanding." Of all current social movements, the peace movement is the one still most rigidly attached to its Cold War mentality; it remains a reflexive anti-US hegemony movement. Note, despite being a discussion of East Asia, almost no mention of China, nothing at all about Taiwan. Apparently the future of Taiwan is not an issue for the people of peace. Brainwashed Chinese transfer rage at their own government to the Japanese embassy. Meanwhile the Taiwan government extends its...essay contest. It's silly, but nobody is getting hurt. Orchid Island nuclear waste dump: "how sick is that logic?" A Taiwan citizen sentenced to 55 days for defaming the Dalai Lama. Say what? 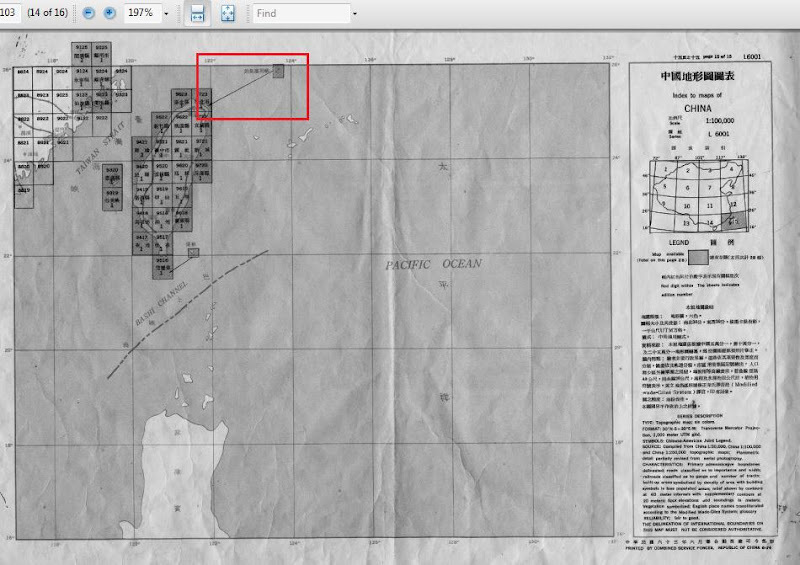 WAY COOL: How Google builds its maps. Yes, that's right, if you type Taiwan is not a part of China, Google translates that into Chinese as "Taiwan is a part of China". It doesn't seem to do that for other countries. Probably need to send a letter to Google translation about this as well as a 'suggested translation'. Hat tip to Eric Pickett. For big size, go here. 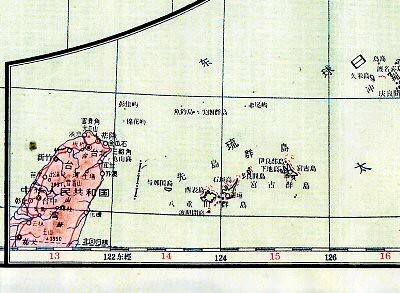 Maddog types in "The Diaoyu Islands are not part of China" and Google not only says that they ARE part of China but adds the phrase "...and their associated islands..." to the text. Apparently Google has been totally pwned by the 50 cent Chinese nationalist loon brigade. It renders phrases with Senkakus correctly. Have fun! UPDATE 3: Sunday night: The mess with Taiwan is not a part of China seems to have been fixed. 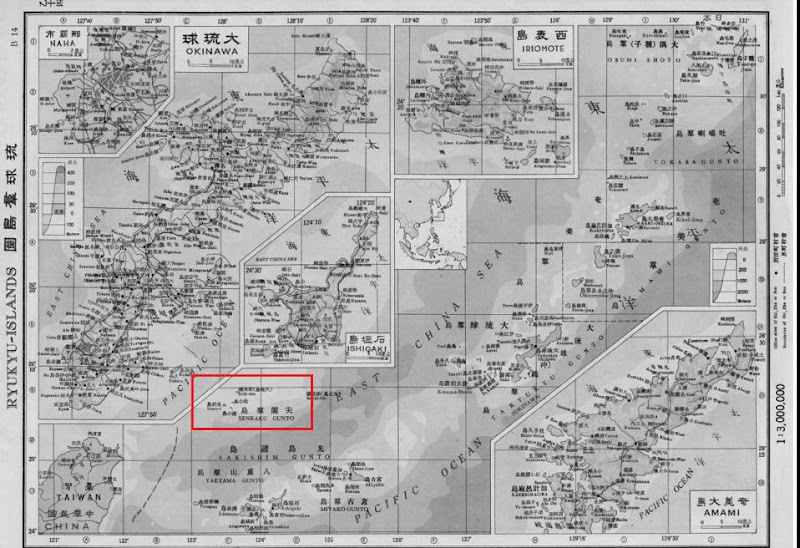 However, just typing in The Diaoyu Islands with no further words still returns 釣魚島及其附屬島嶼. This is clearly political. Rte 130 west of Sanyi city. We climbed up from Sanyi past the museum, reaching the top at 450m. Lovely views, and a great descent that ends in a rush through lovely farmland. Recommended. “We barely see any dishes that look appetizing on the table…it was just so hard to find something exciting,” said one senior trader, criticizing the plan for offering no immediate measures to address investors’ frustrations. Trade-reliant Taiwan has watched exports decline for six straight months as the island’s main trading partners – China, the U.S. and Japan – have all battled slower-than-expected growth. Continuing trouble in Europe, combined with stagnant domestic consumption and investment, have only added to the pain. Taiwan’s economy shrank unexpectedly in the second quarter this year as GDP declined 0.16% year-on-year — the first contraction the island has seen since third quarter of 2009. During the press conference announcing the stimulus package, Premier Sean Chen, widely seen as an economic whiz, said Taiwan would not follow the footsteps of its competitors, such as South Korea and China, who have either cut taxes or slashed key interest rates to revive their own economies. Instead, the former chairman of the Taiwan Stock Exchange and the Financial Supervisory Commission said, the government would consider other medium-term measures. Among them: easing restrictions on foreign laborers and white-collar professionals as well as providing more sweeteners for China-based Taiwanese operators to return to Taiwan. Taiwan’s government, which has run a deficit budget since 2009, doesn’t have much room to cut taxes or hand out cash to boost domestic demand. Even so, the plan disappointed those who expected the government to go for more moderate actions, such as delaying scheduled hikes in fuel and electricity prices or issuing consumer vouchers as the government did during 2008 financial crisis. The real and correct goal of the plan is to address the investment environment in the hope that it will stimulate growth. Meanwhile the US Fed's announcement of another slurry of funds sent the Taiwan dollar to huge gains. Global funds are also net purchasers of Taiwan's stocks, buying $1.5 billion more than they have sold this year -- the TAIEX might even reach 8,000 this year, or 2000 points below where it peaked during the Chen Administration. 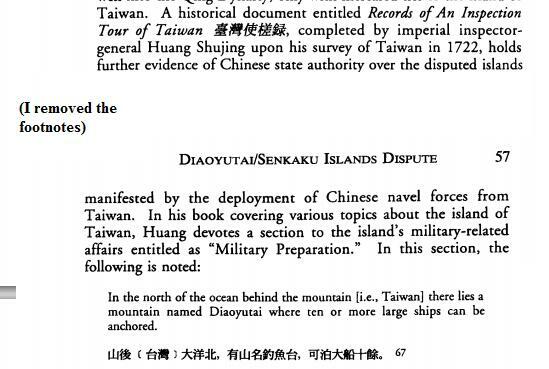 Taiwan sends two ships to the Senkakus. You know, at some point, the humoring of this farcical behavior will probably stop and Taiwan will find itself punished. US Taiwan analyst Richard Bush, weirdly, says that the DPP should embrace the ROC because it would be better able to defend Taiwan's core interests. That would be comical if the issue were not so serious. Which "core interests" would be better off if the DPP embraced an ROC identity (never mind that the ROC identity is a one-party state run by the KMT)? Lessee... keeping China at distance? Nope. Deepening democracy? Nope. Retaining its industries and industrial edge? Nope. Maintaining good relations with neighboring powers? Nope. Maintaining good relations with the US? Nope. 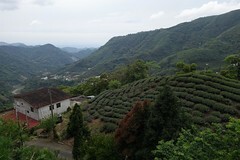 Developing a distinctive Taiwan identity that is marketable from a tourism and business standpoint? Nope. Reducing gangsterism and corruption in local government? Nope. Probably the only "core interest" that might be served by adopting a pro-China identity is that it might smooth some aspects of the relationship with China. American analysts are still stuck in 1950s solutions: if only we could persuade Taiwan to sell itself to China, we can solve the "Taiwan problem." Heh. Just wait 'til ya'll have to solve the "Okinawa Problem." You'll be yearning for the good old days of the Taiwan problem.....UPDATE: Heard that Bush says this is out of context and unnuanced. Good! This motorcycle jumped into hyperspace right in front of my camera. Spent the day listening to lesser known Romantics like Raff and resting after several days of hard biking and traveling. Working on lectures for the new semester was respite from the idiotic Senkaku Islands dispute, which continues to stink up the news like the rotting corpse of a dead animal lodged beyond reach between the walls. Comic relief this week was provided by the pro-China team, in the form of the Ministry of Foreign Affairs (MOFA) recalling Taiwan's emissary to Japan after Japan's government decided to nationalize the islands by purchasing them from their Japanese owners. No doubt the Japanese government was delighted to see him go, since he won't be lecturing them in Tokyo as long as he is in Taiwan. The Japanese representative in Taiwan was also called in and a protest lodged. Completing the farce, far-right activists protested yesterday, right on cue. He urged the government to focus on finding a resolution to fishing rights, which he said was a more important task because it involved the livelihood of fishermen in Yilan County. 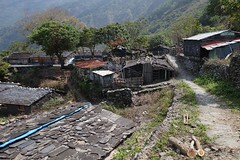 The Diaoyutais have been the fishing ground of Taiwanese fishermen since the Japanese colonial period, Lee said. Since Taiwan and Japan have failed to reach a consensus after 16 consultative meetings on fishing rights over the years, Lee suggested having fishermen’s associations from both sides work out a solution on their own. This is much too sensible. Lee's remarks reminded me of a conversation I had the other day with a longtime reporter on the island, who pointed out that Chen Shui-bian had also focused on the pragmatic issues of getting fishing access instead of making trouble like Ma Ying-jeou -- remember when Ma promised to be a peacemaker, not a troublemaker? Chen not only kept his eye on the fishing ball, he also reduced tensions by reducing the military units in the three small northern islands off Taiwan and switching them for Coast Guard units, the reporter pointed out. 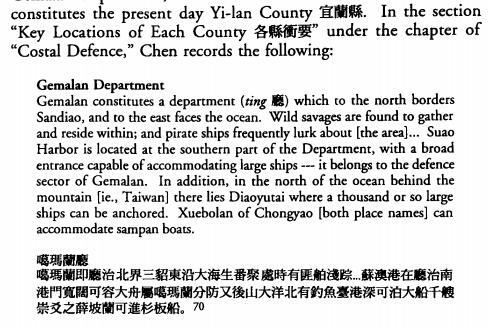 Chen did repeat the bombastic claim that Taiwan owned the Diaoyutai, however, in his own high-profile visit (TT report from Aug 2005). 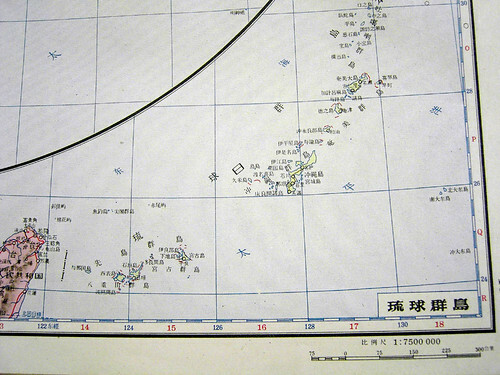 The date of the negotiations will have to be decided by the two sides, but with the current dispute over the Tiaoyutai Islands, the attitude of Japan becomes the most important factor in determining the nature of the talks, Yang said at a press conference held to protest Japan's move to buy some of the disputed islets. 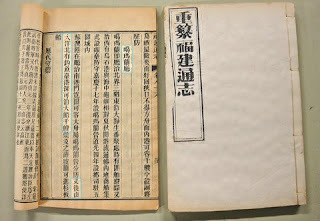 Earlier in the day, Yang summoned Japan's top envoy to Taiwan, Sumio Tarui, to protest Japan's move to buy three of the disputed islands. He said Tarui has proposed to resolve fishery disputes between Taiwan and Japan through negotiations. However, Yang told Tarui that Japan needs to "show more goodwill" and to give Taiwanese fisherman the right to operate in their traditional fishing grounds. "We have not seen Japan showing true goodwill in the past 16 fishery negotiations," said the minister. Yes, that's right, MOFA yells at the Japanese ambassador, blames Japan for the stalled negotiations, and then wants Japan to forget all that and hand them some fishing rights. Yeah, that'll work. The caption on the website reads "This photograph appeared in American newspapers on April 8, 1946. The caption read, "These are Formosan col miners. Barely 8 years old, the boys toil underground to extract coal that never reaches the Formosan people, except through the black market whose prices are far beyond the nudgets of miners' families. This exclusive Acme photo was made by Harlow M. Church, first Occidental photographer to visit Formosa since 1936, when the Japs banned all Occidentals from the island."